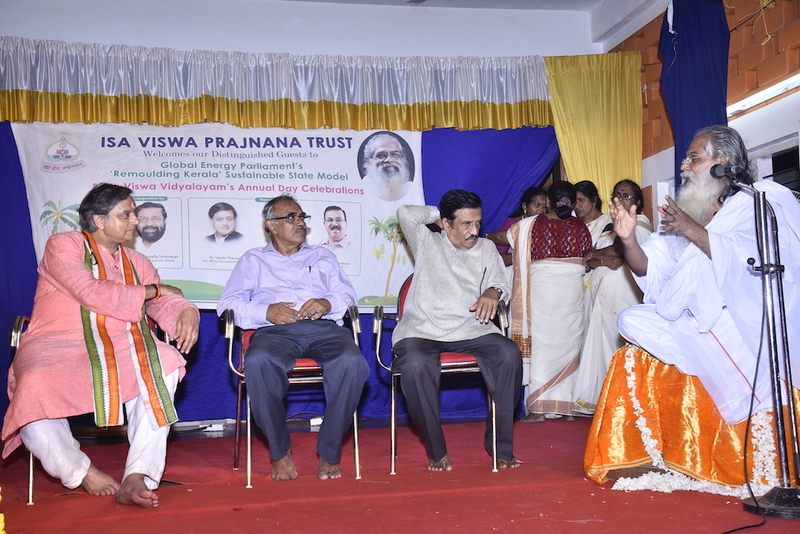 The 21st school year of the Isa Viswa Vidyalayam was drawn to a brilliant close with the Annual Day Celebrations on March 29th, which was inaugurated by Dr. Shashi Tharoor, Member of Parliament, Former Under-Secretary-General for the UN, former Minister of State for the Government of India, and best-selling author. “You get an entire generation of students coming through the school in 21 years. Equally important is the fact that all of you are learning through an experimental method. As I’m told your textbooks are the same as every other student—but how you learn, and what you learn, makes all the difference,“ said Dr. Tharoor in his Inaugural Address. “As somebody who has spent some time thinking about education, I always say to teachers, please don’t teach the children what to think, teach the children how to think,” he said. He encouraged the students to think originally and creatively, and “I urge you to benefit from this new way of thinking and teaching,” he said. Swami Isa gave an Address highlighting the uniqueness of the Vidyalayam, which is its emphasis on “quality and not just quantity of knowledge.” He expressed that the real role of education, and how it is practiced here, “is to bring about greater purity in the human being, not just accumulation of material information, as Shashi Tharoor has eloquently explained. This is the need for every genuine educational institution,” he said. Dr. Tharoor presented the Best All-Around Student Award to Devin in 8th grade, and the Academic Achievement Award to Arun in 7th grade. Mrs. Radhamoni, who has been teaching dance at the Isa Viswa Vidyalayam since its very inception, was honoured for her years of service and devotion, and presented with a memento and shawl by Dr. Tharoor. Other awards were presented to the students by Honorary Professor of Physics and University of Kerala, Dr. V. Unnikrishnan Nayar, IVPT Secretary Dr. M.R. Thampan, and Dr. George Varghese, former Professor of Engineering from Mar Ivanios College. The inaugural function was followed by a delightful Cultural Programme of dances, dramas, poetry, and music based on the various lessons that the students had learned during the year.